Be a meal prep master! Batch cooking allows you to use up ingredients when they are at their best, as well as helping keep your healthy eating on track. 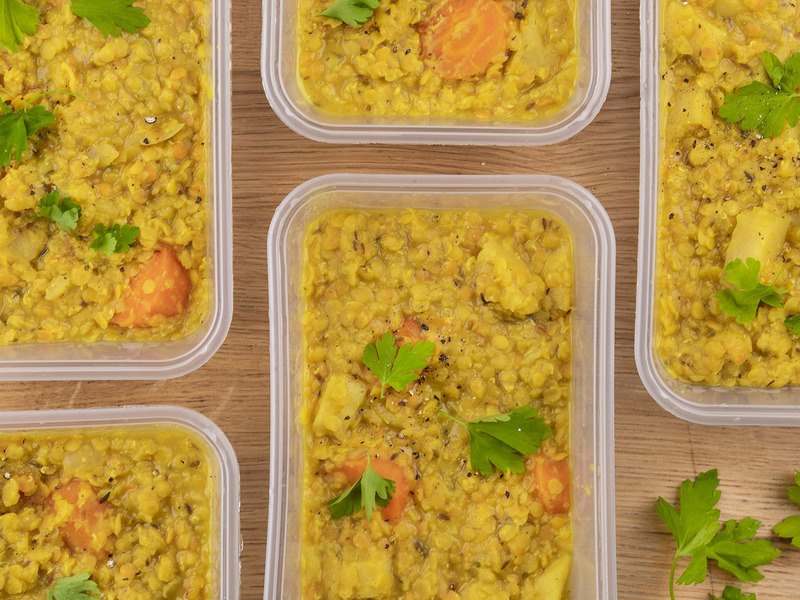 Whip up this delicious dahl and look forward to lunch all week (or freeze a couple of portions for lazy dinners). In a saucepan, combine olive oil, and 2tbs water with onions, sea salt, oregano, cumin, cinnamon, turmeric and chopped carrots. Cover and cook on medium heat for 4-5 minutes with lid on, occasionally stirring. Remove the lid and add lentils and the rest of the water. Bring it to boil. Reduce the heat, cover the saucepan and cook for 15 minutes. Core and chop up apples into 1cm cubes, add to the lentils along with the lemon juice for some extra tanginess. Cook for another 7-10 minutes or until desired texture. Cool and portion out into freezable Tupperware with a sprinkle of chopped coriander. Heat up at lunchtime - enjoy!